The nucleus of an intervertebral disc is approximately a circle in horizontal section. It is an ellipse in vertical section. The computations involved in estimating the forces applied by such a figure are complex. However, it is valid, for our purpose, to regard the nucleus (Fig. 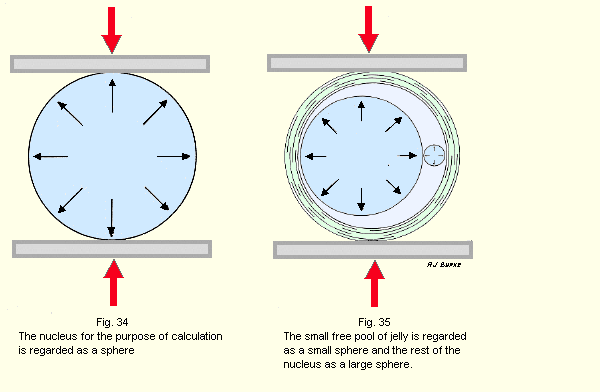 34) as a sphere, and also to regard the small free drop of jelly as a small sphere (Fig. 35). The pressure inside the small sphere is also P.
To this figure must be added the radial pressure exerted by the large sphere on the small sphere. The small sphere behaves much like mercury which has been dropped on a clean glass surface. The minute drops are spherical. The larger volumes lie in flat pools.